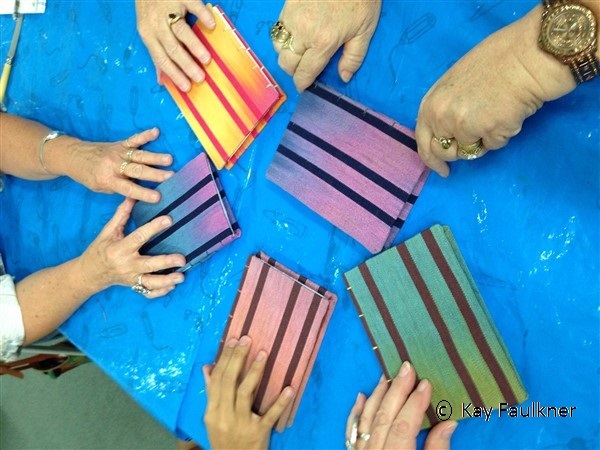 This month I’ll review the latest 5 day class in the studio and the results of the challenge with the hybrid loom. 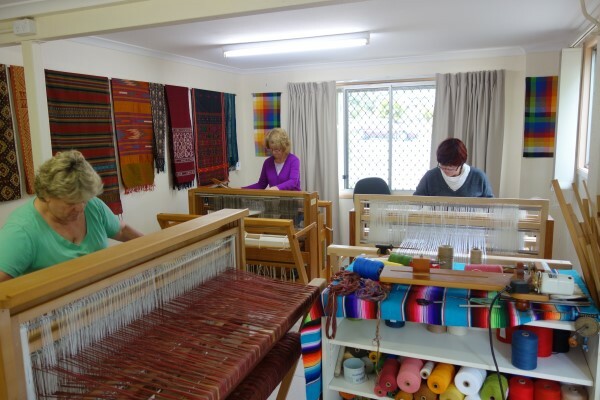 Rochelle returned to continue weaving her throws. She brought back the throw she had woven the previous month for finishing. After laundering, this throw is so soft and cuddly and it has achieved the magic of tracking: a random twill like effect that sometimes appears on plain weave when the twist of the ply and the sett combine. This is one of the best examples of tracking, I’ve seen for a while. It sure does add interest to this cloth. And then she started another throw. And finished it. Here’s another very cuddly alpaca throw. 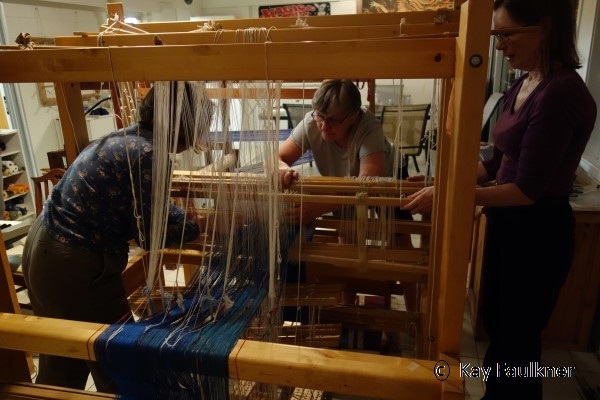 While Rochelle was weaving her throws, the focus for this 5 day class was on weaving floor rugs. Sue brought a palette of hand spun alpaca. 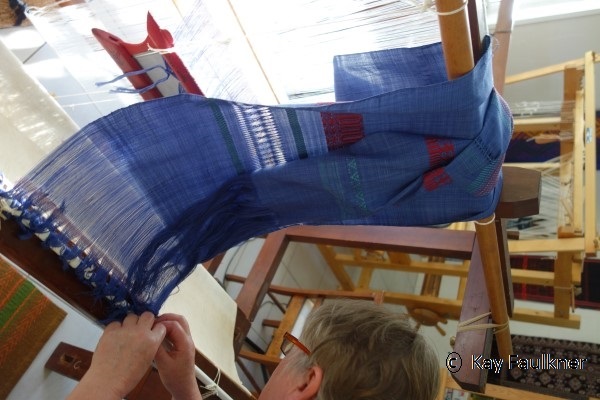 She wove stripes on plain weave and explored some weave effects. Here the rug is coming off the loom. What a great result Sue. It is nearly finished, just half one side of fringing to go. 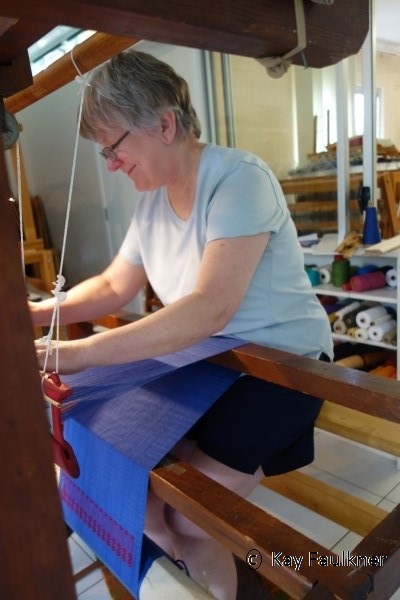 Marja returned to the studio to weave a rug on a twill threading. She was inspired by some of the effects that could be achieved by sequencing of colours in the weft. Here it is coming off the loom. It’s exciting to see how the colours and patterns work together. She has totally finished her rug. Congratulations Marja. 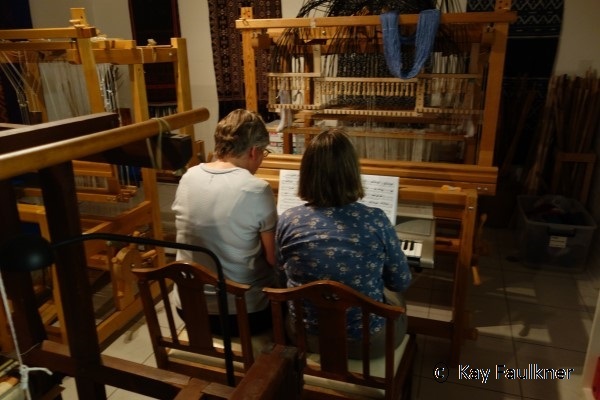 I flagged last month that I would review the results of the experimental warp from the hybrid loom: one that has a countermarche action and long eyed heddles in combination with storage systems from S E Asia. Here are all the techniques that were woven on that one warp with no rethreading of the warp. Next I found a technique in Becker’s book and explored that (last month). I picked up the start of that pattern and stored it on the vertical storage and added a horizontal system. That same picked up design was used to weave an isolated motif as a supplementary weft. Not bad for just one warp isn’t it? 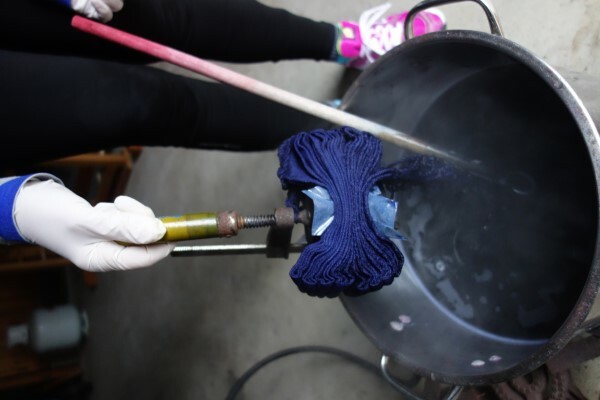 There are 3 totally different techniques: supplementary weft including brocade on plain weave, damask and the plain weave with twill motif from the Han Dynasty. 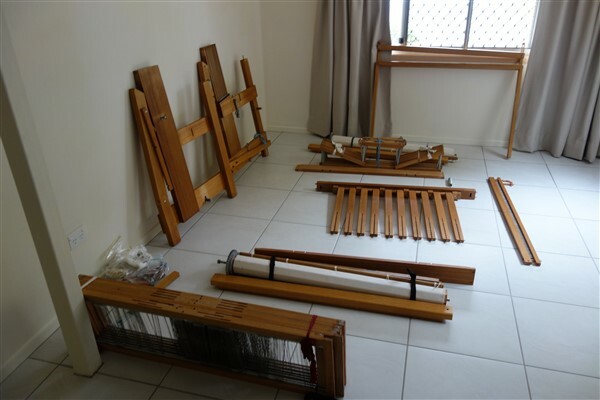 The question is posed: which is the more versatile loom? Is it a conventional draw loom or this hybrid loom that is basically a conventional countermarche loom with a Lao/Thai addition? Could I have woven all those techniques on the draw loom? The answer is of course yes with some forward planning. 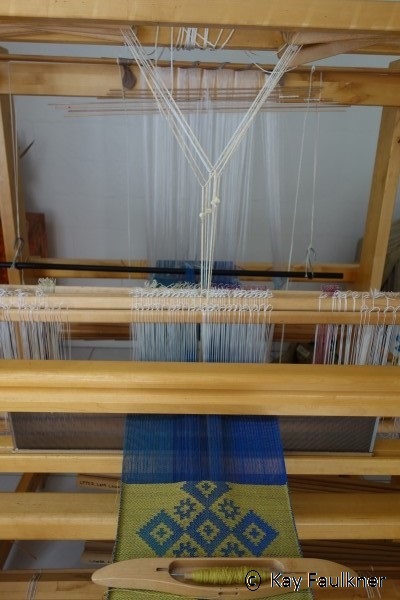 If I knew I was going to weave these techniques on a draw loom, I would have threaded the back set of shafts (the pattern shafts) two to a heddle. (Normally on a draw loom if I was going to weave a 6 end damask, I would put 6 ends through the one eye.) The front set of shafts would then be threaded in a 6 end straight twill. The effect is the same. However the only difference is the Lao/Thai vertical storage system is always set up 2 to a heddle. 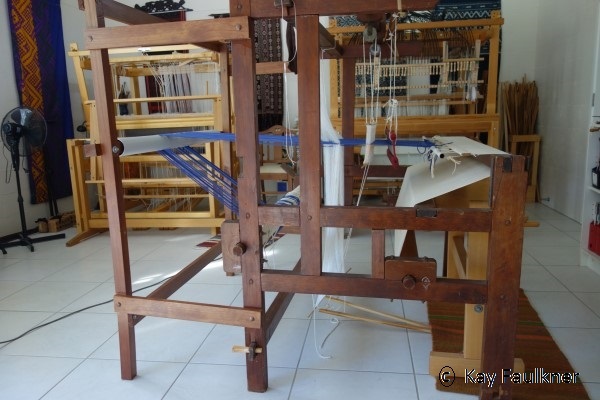 The only forward planning I made on my hybrid loom was to choose to use 6 shafts instead of the conventional 2 because I knew I wanted to explore how easily damask could be woven on that system. And because I was limited by 2 threads through the heddles of the vertical storage system, I knew that the satin for the damask needed to be multiples of 2. The rest of my experimentation happened because I saw a technique and had the perfect set up that allowed me to play. The next question to ask is which can achieve the more complex repeat patterning? 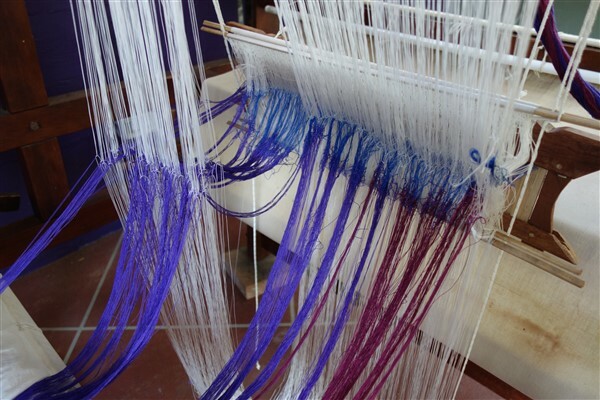 If both looms are set up the same: 2 warp threads through either a pattern heddle or through the vertical storage system and an appropriate ground weave, the only limiting factor will be the way that the pattern is achieved. On my draw loom, I am limited by 50 pattern shafts. If I had a single draw system then I could individually pull each row, in essence picking up whatever pairs I wanted for each row. 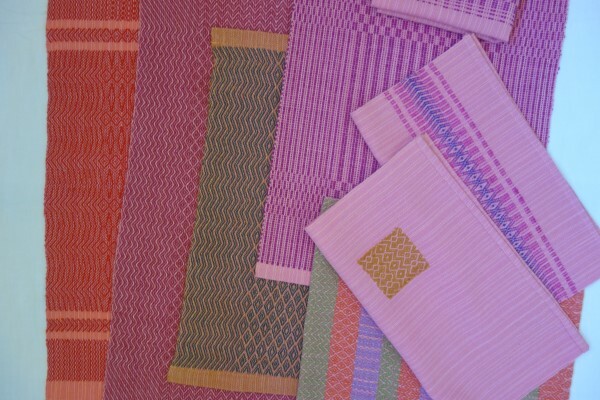 On the Loa/Thai loom, I pick up the pattern and store it. Once stored the pattern rows are used in sequence. The number of pattern rows could be hundreds. 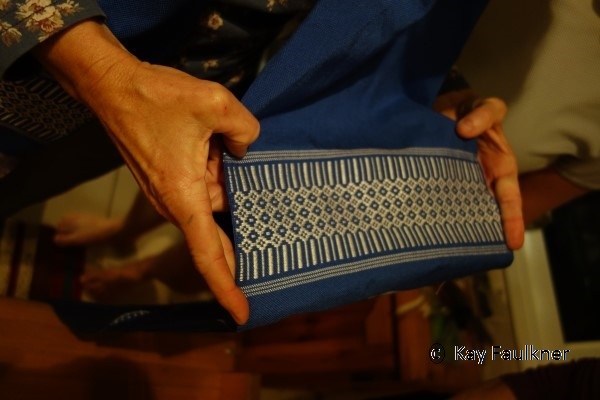 In the Lao/Thai system the weaver picks up the design with a stick and transfers the pattern to behind the front ground weave shafts to be stored. The picking up of motif takes time. On a draw loom with an individual pull, the weaver conveniently sits at the front of the loom and pulls cords to select the pattern a row at a time. Lastly, announcing the 2018 studio class schedule. Full details are coming. 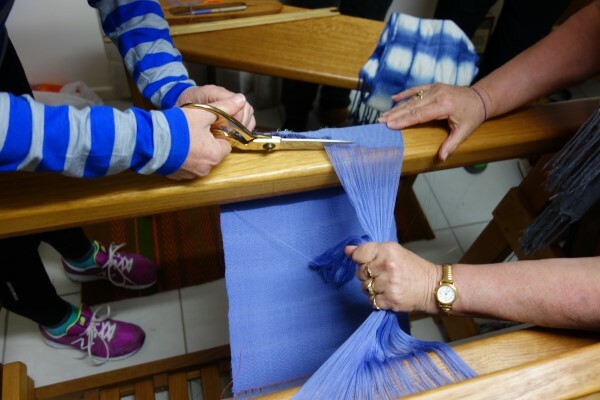 8-12 January (4 places left) and 19-23 February (1 place left) Linen and Lace Learn how to weave trouble free with linen. Explore various lace weave structures. Linen and lace is a beautiful combination. 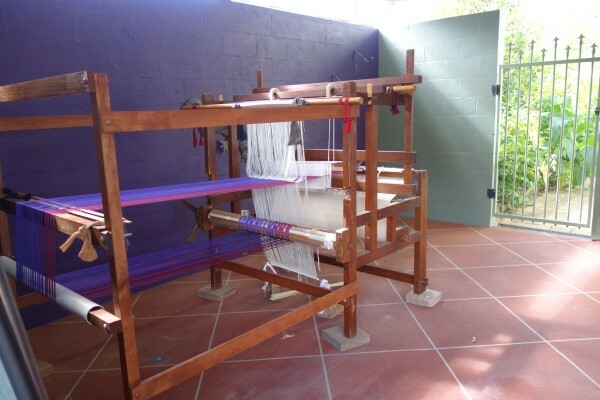 Looms will be set up so you will not need to thread before weaving. This has been a very busy month teaching away from the studio firstly in Ballarat and then for MAFA in the USA. 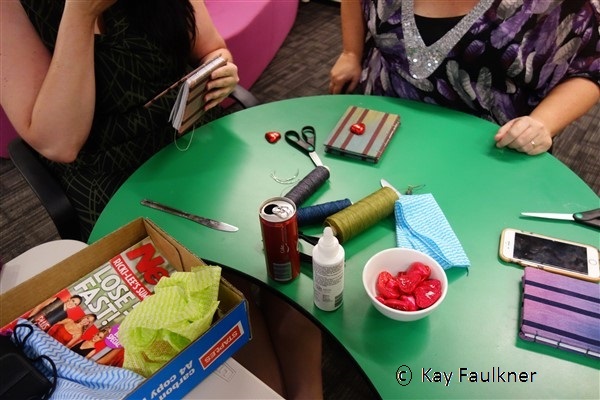 At the Ballarat Fibre Arts Australia event, the title of the workshop was Play +1. Each of the students chose a different topic to explore – in other words, play. 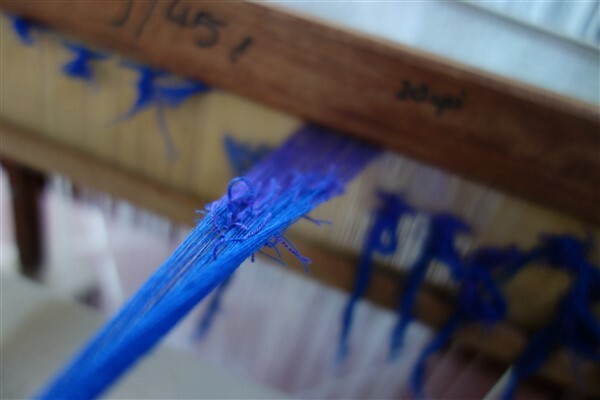 They could choose an aspect of double weave or mixed warps or a technique of their own choice. There was as a result total diversity. After exploring their topic for 3 ½ days they added an extra component in an extra shaft to achieve a more complex cloth. But before we started the workshop, there was the matter of a decoration for the top table. I took the opportunity to produce this in the “meet the tutor” afternoon slot. This was a fun activity: a bit of stitching and needle weaving into gutter guard. Everyone got to do whatever they wanted and using whatever yarn they wanted. It was also a great opportunity to meet new and catch up with past students in a very relaxed manner. Elizabeth started with an unfinished scarf as her project. 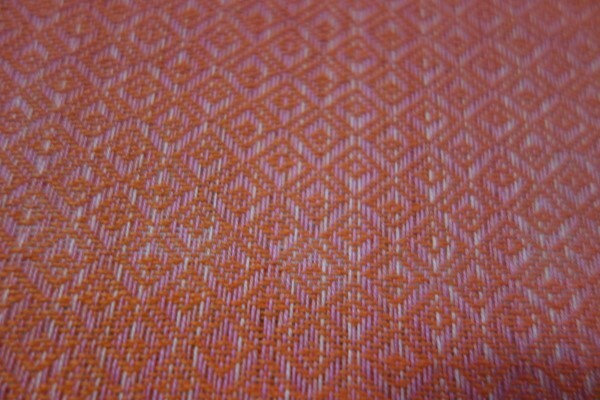 It was colour and weave on a 4 shaft twill. 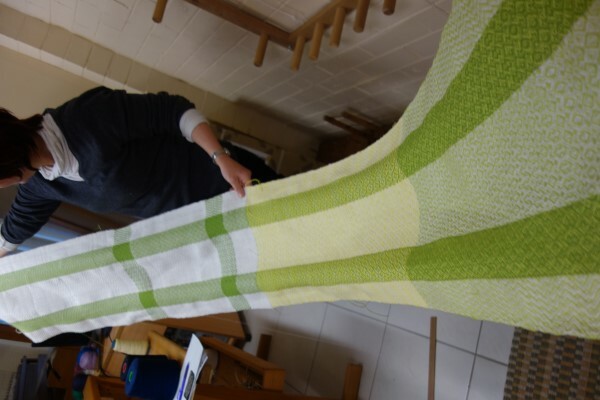 After finishing her scarf she explored colour and structure variations, including removing and replacing a few warp colours before adding in an extra shaft for a supplementary warp. Jeanette explored combining lace and summer and winter. 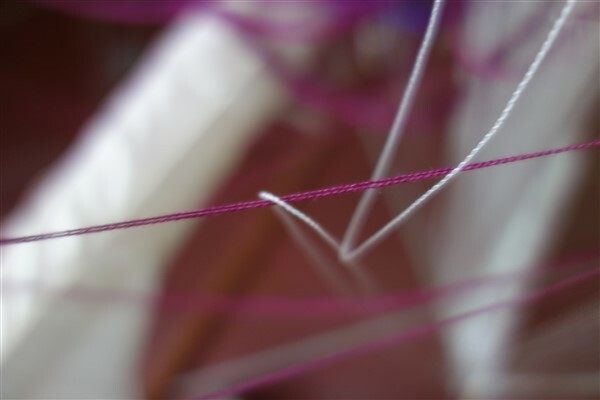 This provided the opportunity to explore both structures and some creative approaches to a block of warp threads that didn’t weave. Her extra shaft was used to fix a threading mistake. Trudi explored double weave with Summer and Winter as one layer. There were lots of variables here. Jillian explored double weave and rotational blocks. (Colonial overshot) and then introduced an extra warp thread on her extra shaft- one that she moved around changing it from one position in the reed across the weft and to a second position. 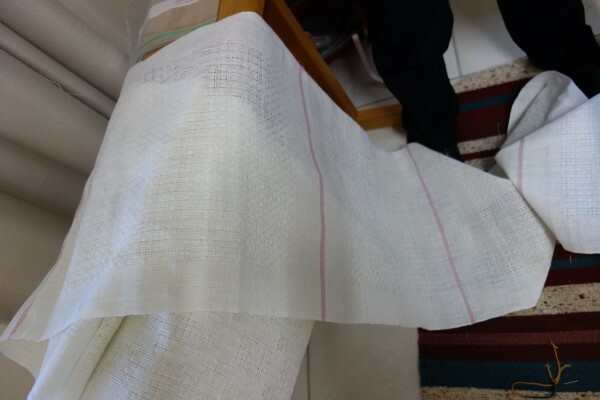 Di came with a sample of double weave that we then interpreted into a 12 shaft draft. The draft combines blocks of twill and plain weave. Michael arrived mid workshop and luckily there was a loom set up. It was destined to be rag mug rugs. However, this was used to explore variations of plain weave and then by adding in an extra shaft, it was possible to achieve a 3 end twill. At the end of the week, the class puts on a display of their work. This is what was achieved. Unfortunately I had to leave early but I was delighted and privileged to spend this time with them. I must also acknowledge the great team that organises the event: Noni, Glenys and the Golden Team. Check out Fibre Arts Australia for details of the next Ballarat event and others run by this organisation. http://www.fibrearts.jigsy.com/ event. Later in the month saw me at Millersville in the USA for the MAFA conference. 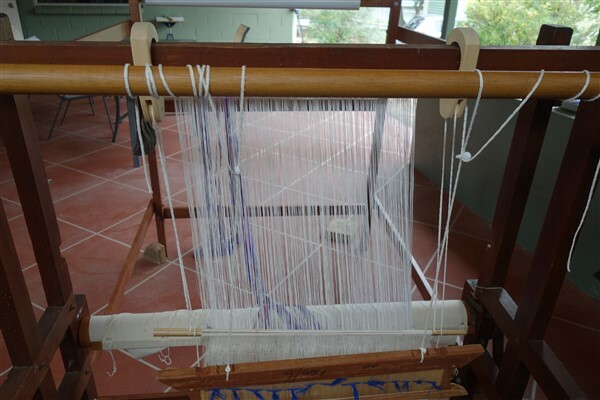 The class was East Meets West where various back strap structures and techniques are interpreted for a western shaft loom. It was a great class of 11 students and everyone accomplished much in 2 ½ days. Here’s an overview of what was woven with each student choosing their favourite section. Apart from the workshop, there was such a lot to do: catching up with friends and the market place and various structured activities including a fashion parade. Those who were involved in the organisation put on a great conference. After the conference I had the opportunity to visit with my friend Judith Krone in Atlanta. 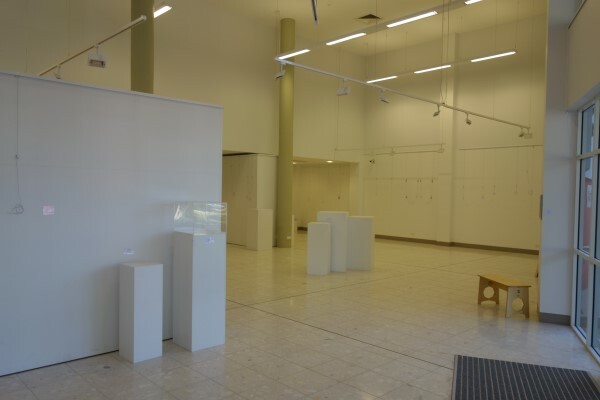 On one day we got to see these two exhibitions at Lyndon House Art Centre in Athens. 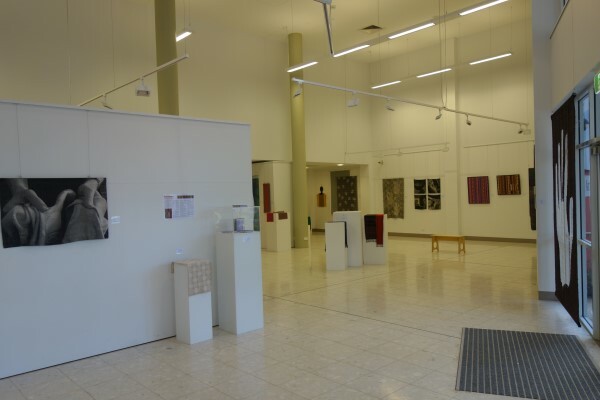 The first one was Time Warp….and Weft, an exhibition by 6 artists. This is the artist statement followed by an overview of the gallery and work by Geri Forkner that could be walked through. The second exhibition was Fold Unfold. 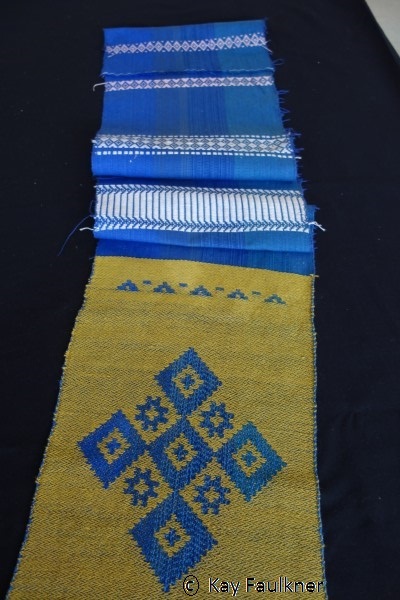 About 50 weavers/ university faculties created coverlets. Each of these were folded and placed in a pile. They will be opened at an “unfolding” event. It would have been great to have seen at least one of them unfolded and displayed. Accompanying the exhibition is a movie of each individual work unfolded with a detailed view. This of course can’t replace seeing the actual work. 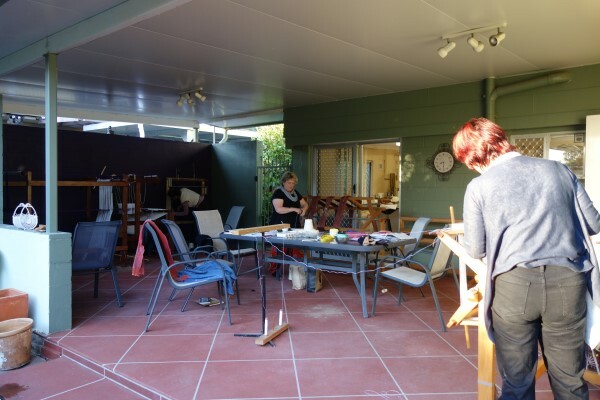 The other very important activity at Judith’s was our dyeing day. 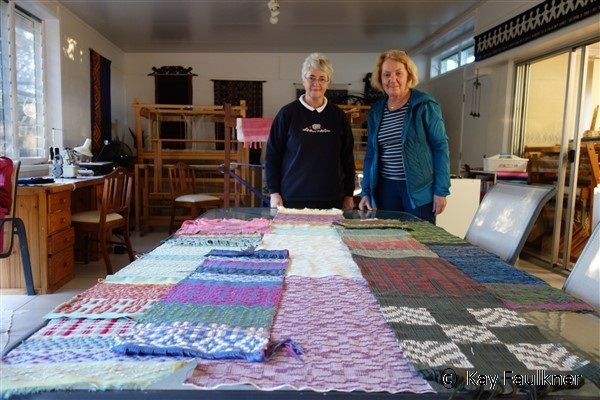 Judith and I have established a tradition of weaving a joint project over a two year period. 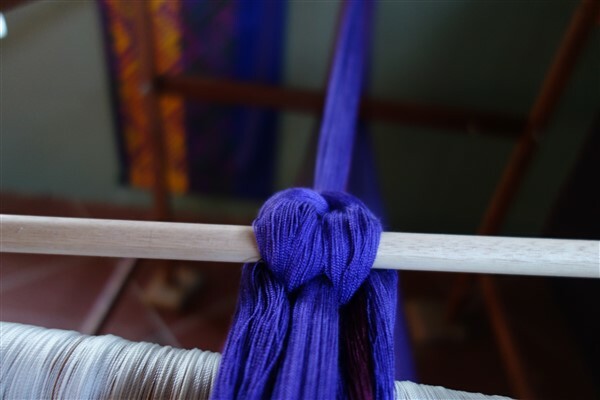 The first year we each wind our warps of 2 scarves each warp, dye and swap. The second year we weave two scarves with the grand unveiling of the project occurring where we exchange scarves. 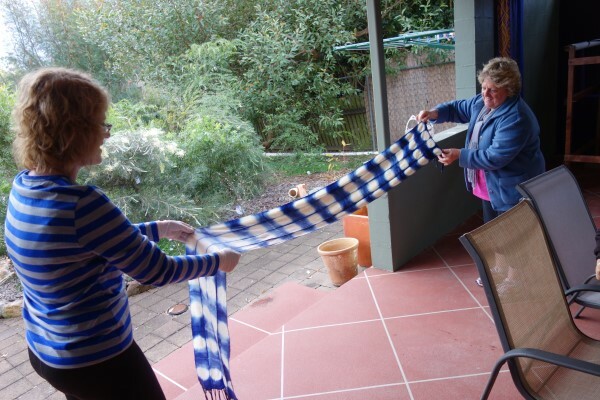 Each of us ends up with two scarves (one of each other’s dyeing and the other of each other’s weaving). You may have seen previous results of our collaboration. Anyway this is the start of our 5th project (10 years). This time we dyed the two warps together and have swapped. What colour? Well you will just have to wait and see when all will be revealed next year. Coming up- a 2 day workshop at Go Create (www.gocreatenewengland.com) on the 9-10 September and workshops in the studio. and is getting one step closer to weaving a proper project using her hand spun mohair. Here she has put on a quick test warp to evaluate both how her spun mohair performs and to calculate shrinkage. She also wished to try out a table loom as she thinks that will fit her space requirements when she gets her own loom. Sally is also a beginner weaver. She is obviously having a great time learning to weave. Here she has finished her first warp: a collection of handtowels. Then very quickly there was a series of tea towels: to explore both how to weave her MacPhee tartan (colour sequence) and to explore various twills. Then even before she had finished off those she was planning her next project: a tartan scarf. As she says who would believe just a short time ago that she’d now be weaving and dyeing. In the meantime, I worked on a couple of scarves in double weave with supplementary warps. But then I decided to turn one of these sections into another narrow band of double weave. But how was I going to do that? Well it’s simple really: just add in a couple of temporary shafts, Laos style. What I did discover was that they were so easy to use. Then at the end of the month three friends from my time at Sturt arrived for a 5 day intensive. Each had their own project. Sue wanted to explore lace weaves but more than that wanted to understand the relationship between design, profile and drafting. She wove and initial sample. 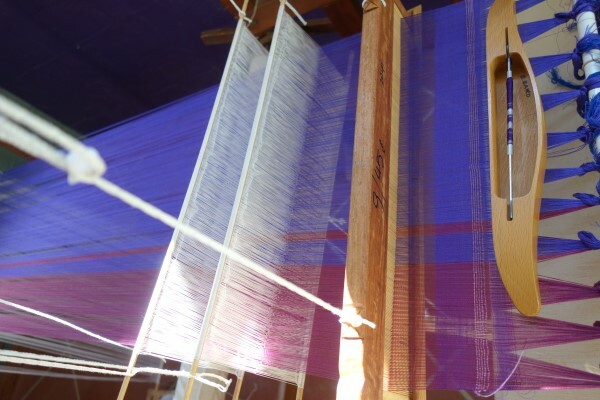 Then after working on theory and developing a design wove a second warp. Helen came knowing that she wanted to weave lampshade fabric to compliment an oriental lamp base. She’s requiring both fabric and accent braid. As the braid was the more complex she decided to start with that. Gillian came knowing that she wanted to weave curves and explore network drafting. We worked on several design approaches. One was selected to weave into a scarf with additional sampling as time allowed. 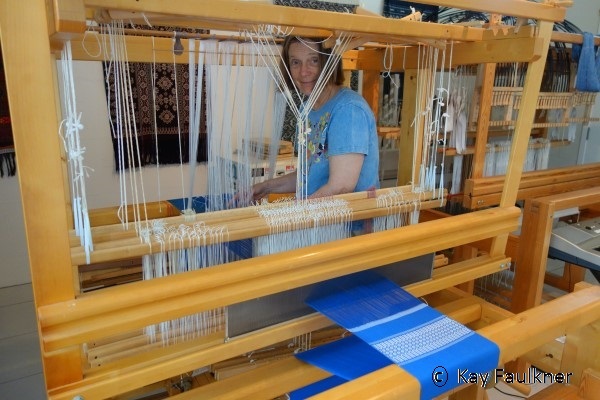 What was an interesting experience for her was going from her usual table loom to weaving on a computer assist loom. It was great having such a diverse range of requirements as each learnt from each other. In addition there was time to spend together. Eventually the weather turned and those Southerners got to experience glorious Queensland winter. We even took time out to have lunch and play at Wellington Point. While they were here, I got to start threading my draw loom. Eventually I’ll get to weave on it though it will be some time till I can. In the meantime I’ll get it set up. What I do like about drawloom weaving is the flexibility in deciding what to do with pattern shafts. They can be rearranged so easily. I’ll just get the loom ready to weave and decide later what I’m going to do. I do have 126 pattern blocks to play with. My studio is nearly finished. What a very nice way to end the year. I am so looking forward to working in this space. To do is some tiling and then to move looms. It should be finished for the first class in the New Year. Here’s progress this month. The painting gets done. I say goodbye to the purple wall. I need light in here to work. And the very next day, we had heavy rain. The gutters overflowed but there I was dry inside. 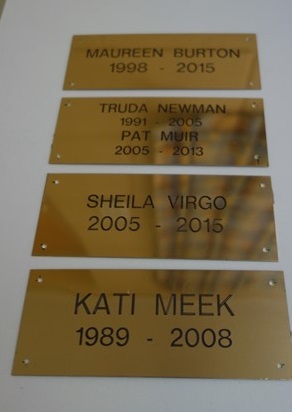 Kathryn, Barb, Ann and Maggie were in the studio at the start of the month. They worked on independent projects with great results. Kathryn experimented with 4 layers of weaving, swapping the layers around to achieve different effects. Ann explored different 4 shaft twills. Barb explored twills on 8 shafts. Maggie explored woven shibori with shirts that had been cut up. Here she is pulling out the resist threads to reveal the dyed pattern. Fabrics washed and hung out to dry. A very important part of any workshop is time out. In this Festive Season, I’ve had a lovely few days weaving in the new space. I’ve got that warp to finish off. For this next experiment, I had rethreaded the original warp on 4 shafts as I wanted to see how it would perform. The loom action for those of a technical bent is counterbalance (when two shafts go up the opposite two go down linked by a pulley system) I’d also increased the spacing of the warp. 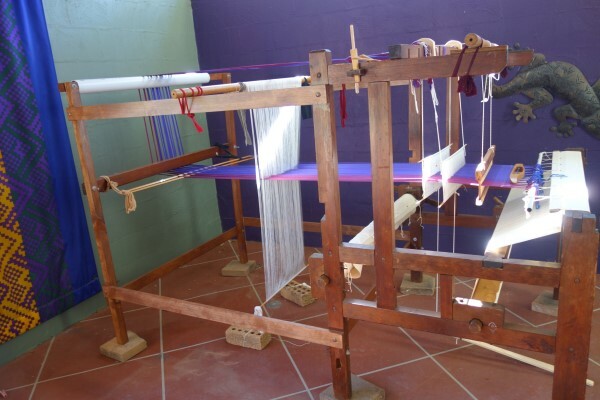 I also wanted to explore was the effectiveness of using normal treadles on this loom. Two sticks of wood as treadles were very floating and of course have a tendency to move. Maybe fixed treadles would make for more effective weaving. I have taken bits from a couple of looms to rig up these treadles. The original ones were very heavy. I knew I would have issues working the vertical storage component if it were too heavy. Of course it was much easier to weave. By the way the extra horizontal bars will be necessary if I’m to do any sort of patterned four shaft weaving. 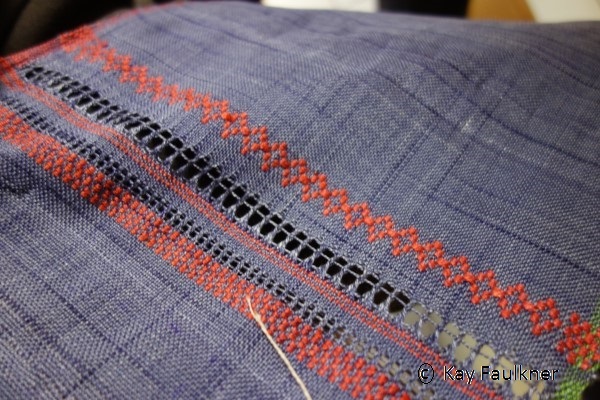 I got to weave about 30 cm of plain weave before I came to the pattern area. OOPS! These treadles even though they are as light as possible make moving the picked up pattern to behind the shafts just way too difficult. There’s just too much weight. So back to the drawing board and I have put back on the bits of wood. Four shafts tied directly to the treadles. It works! A comment would be though that it is much easier to transfer the picked up pattern when there are only 2 shafts. Having 4 shafts would have meant that I could do some extra patterning similar to what I had done on the draw loom. What I’ve tried here with the treadles and their inherent weight problems will mean that I’ll need to find an alternative to make that possible. 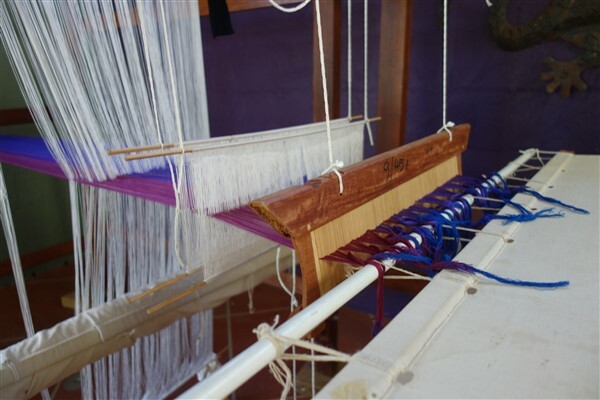 Some features of a western style loom are not as efficient in this case as the original Laos loom. Here’s my 46 stick pattern. This is a much more complex pattern than I have previously used. The piece of paper attached to the beater makes seeing the threads much easier. The purple against the dark wood is really hard to see. Note the series of pattern sticks storing the design. Here’s a quick preview of some of the classes starting in the New Year. Full details of these and others will be posted under “My School” soon. 18-22 January. Linen and Lace. This time last year I was in Canada experiencing snow. I have my own snowflakes. They seem appropriate for here. The major event this month has been the launch of my school with a five day workshop. Students came from far afield: Bowral, Wollongong, Northern NSW, Mt Tamborine. They were a very diverse group with a range of experience, all coming together for a great week of weaving fellowship and fun. Note! I have updated the list of classes available till the end of January. 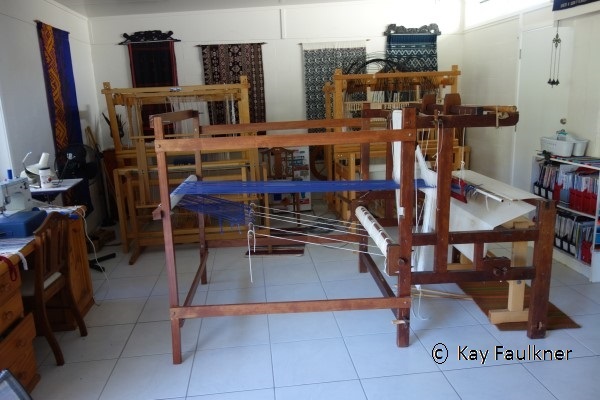 Please check out the page at the top under “Kay’s Weaving School”. Day 1 saw us gathering, discussing projects and preparing warps. Some used warping boards, others mills. Some prepared inside, others outside. It was suddenly a hive of activity that never let up till the very last moment of the very last day. Day 2: They threaded the looms. And by the end of day 3 they were weaving. Day 4: By late afternoon both Bronwyn and Joan had finished their projects. It was pretty much a dead heat in who finished first. Joan cuts off her fabric for a vest. 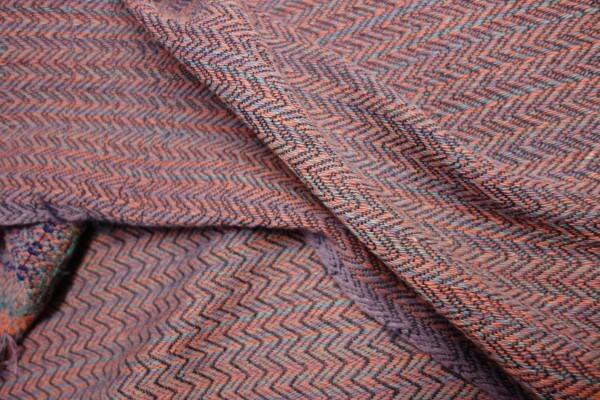 Joan’s fabric has a mixed coloured warp woven in an 8 shaft twill. This photo is of it after it was laundered the following day. There was much discussion which was to be the “right” side. Bronwyn cuts off her silk scarf. It has an interesting progression of pattern from a plain end to a more heavily patterned one. That night she twisted the fringe as she wanted to dye it. So what were they going to do the next day? That night I set both of them a challenge by rethreading their looms with warps similar in threading to what they had been working on. 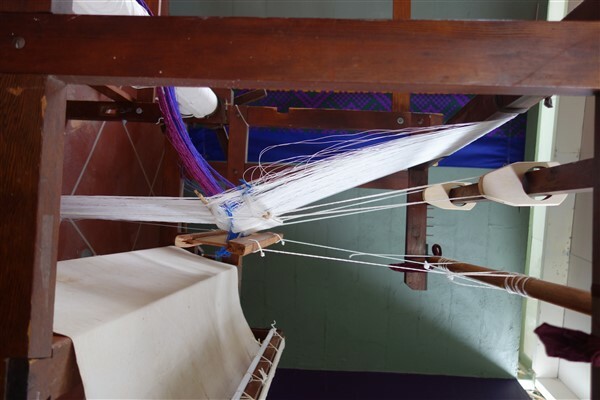 The challenge would be for them the next day to experiment with pattern diversity using the same treadle tie up as they used for their project. Day 5: Bronwyn dyed her silk scarf using a clamped shibori technique. And wove with the same twill threading, this time experimenting with woven shibori. She gets to take home the piece to pull up and dye. She used fishing line as the supplementary thread which is why it is difficult to see. Joan wove on another mixed coloured warp this time in shades of pink cotton, experimenting with variations of the same treadle tie up. Sharon finished her knee rugs by mid day and spent the rest of the time plying fringes. She has two beautiful and very different knee rugs from the same warp, one in plain weave, the other in twill. 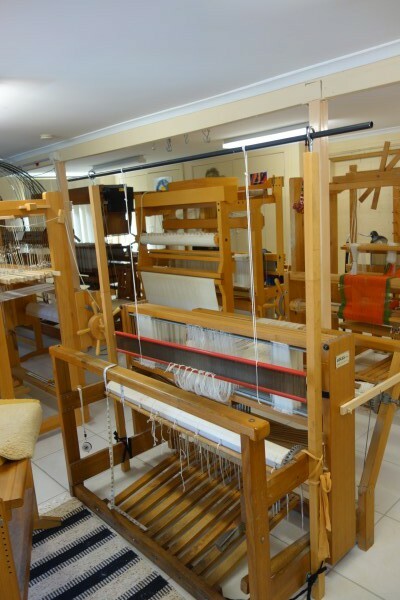 Vilasa’s goal was to learn about countermarche looms as she had one at home that hadn’t been used. As well as going home with a greater understanding of the loom she has a very nice collection of 4 tea towels in different effects. Belinda completes a long series of ten linen napkins. They will be beautiful when they are washed and the lace weave opens up. It was an amazing 5 days. I am so very pleased with how much each of them achieved. It really was a lot of fun! The diversity of projects allowed for learning covering a wide range of techniques and design considerations. I thought I’d share some comments. They perhaps explain what made the week so “Special” and for me lived up to the title I’d given it. 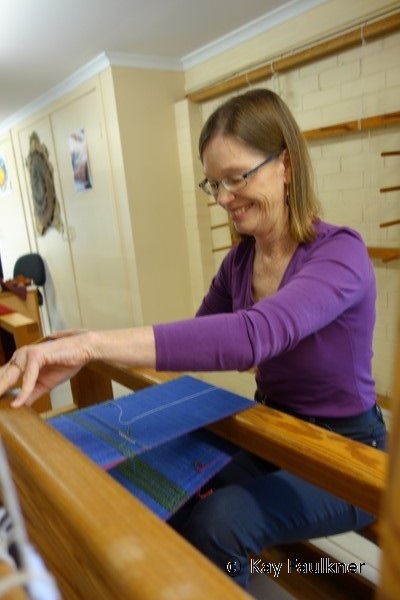 So Kay Faulkner is not only a master weaver but also a superb teacher who can keep 5 different students on 5 different looms energised and learning over a week long class. 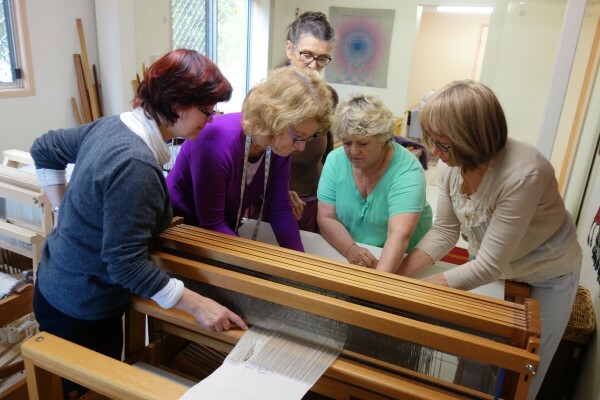 Each of us crossed our own personal hurdles: weaving yardage for fabric, learning how to set up a loom, how to blend yarns in the warp and or weft, how to change the patterns woven part way through a length, how to do clamped resist shibori. 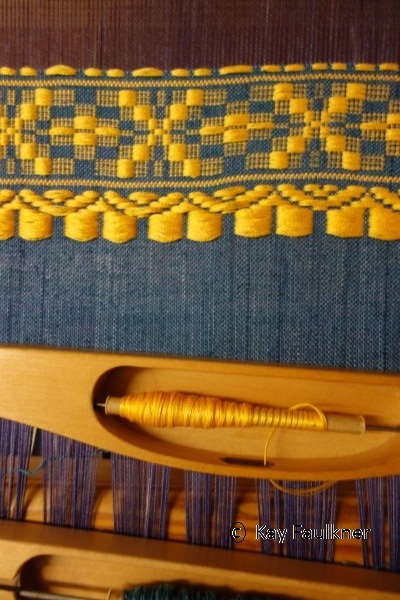 I wove 10 table napkins in linen, in two different huck-lace patterns, finishing on time on Friday afternoon, despite a stressful moment on Wednesday when I discovered many flaws in my threading through the heddles and reed. Kay showed me how to fix them, and set me the target of 5 napkins a day. So I completed a major project ( for me) in a week! 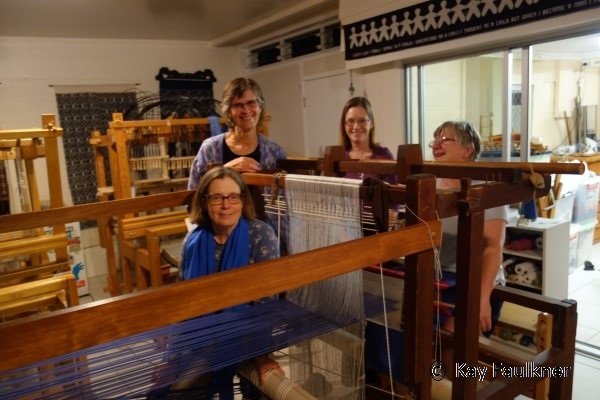 We were a great group, funny and lighthearted in the breaks and in earnest at the looms. Kay is a generous and organised teacher, with the resources to take each of us up a step in skill levels despite not all starting at the same level. 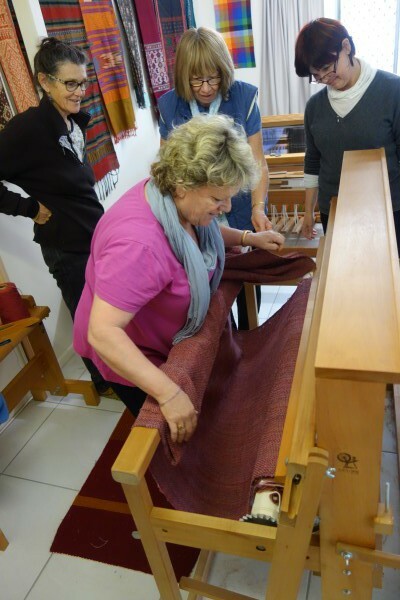 It was a great week, one I highly recommend to any weaver wanting to improve existing skills or acquire new ones. 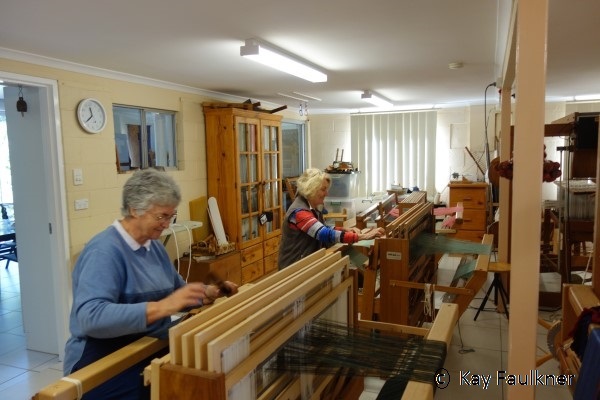 Thankyou Kay for your patience in passing on your knowledge and for making weaving so”understandable” and enjoyable and not being afraid of. 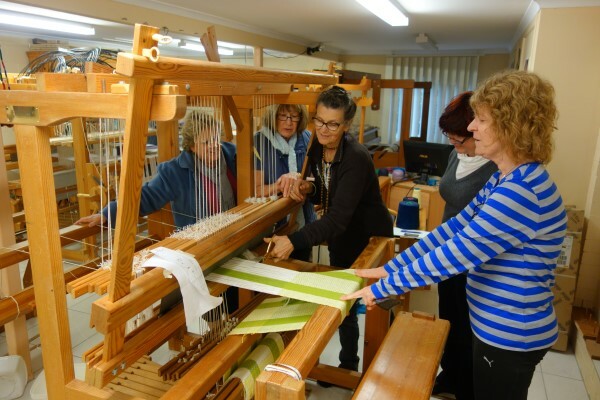 Many thanks for accepting me in your inaugural ‘Special School’ week of weaving. From the moment you opened the front door of your studio with such a welcoming hello! and a large smile I knew I was going to have a wonderful experience. 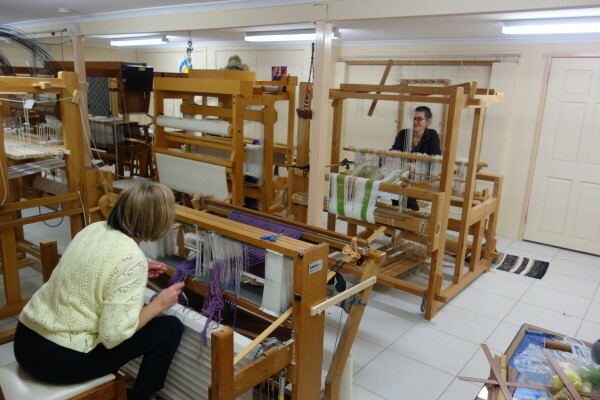 Your range of floor looms is nothing short of amazing and the studio space airy, large and very pleasant to work in. This was my first experience using a floor loom. The self-contained kitchen facilities for preparing lunch and dinner were much appreciated as this enabled me to have meals without leaving the studio thus enabling extra time for weaving. 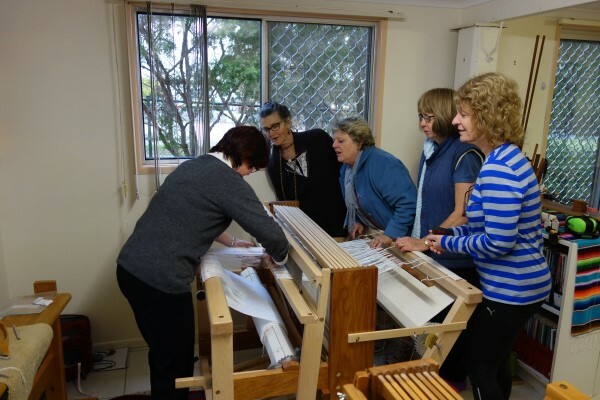 Your experience running weaving workshops certainly shone through with all 5 participants finishing their projects in ample time to sit back and discuss the finished project in depth with you. For me personally I cannot believe I actually wove 3.5 m of a beautiful twill fabric for a vest. Not only was my finished fabric beautiful on and off the loom it blossomed once it was washed and steam ironed at the studio. I cannot thank you enough for your guidance in selection of yarn and structure for my chosen project. Your teaching skills, knowledge and patience were exactly what I required to advance my weaving skills. 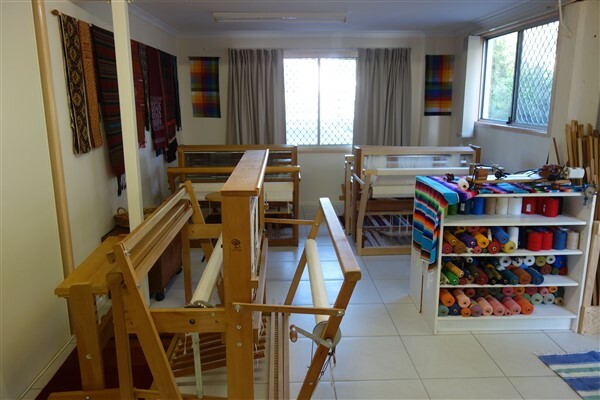 I am now confident for the first time to wind a warp, dress a loom, select structures and yarns suitable for an end use and weave a finished project on a floor loom. Your home cooked treats for morning and afternoon tea just topped the whole experience off for me. Last but not least many thanks for adjusting my vest pattern for me. 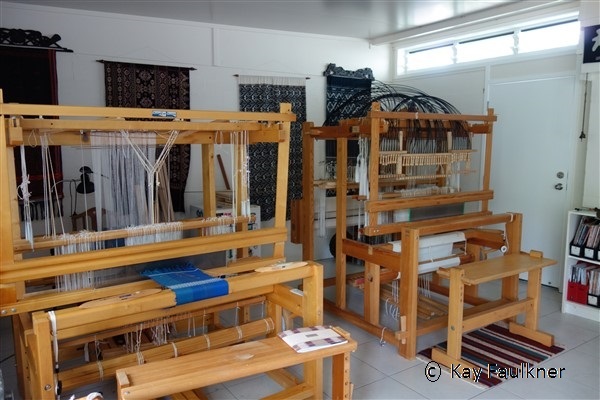 I have spent the day since my return home searching the internet for the best floor loom for me and I will run my findings past you when we next meet at your weaving studio in the near future. Once again so many thanks. PS I have just completed putting a warp on my table loom and just now sampling structures in twill. What can I say! 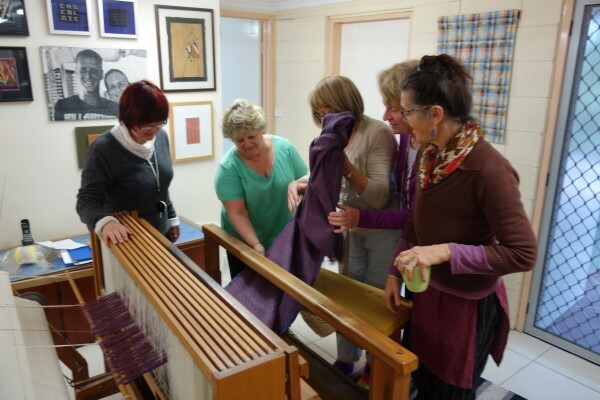 A fabulous week weaving with Kay at her inaugural weaving school! 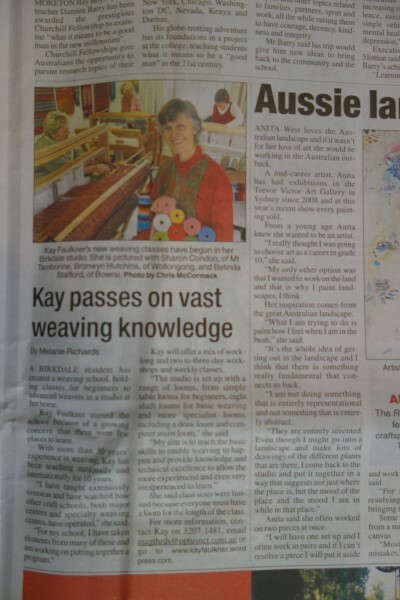 Kay is a fantastic teacher of weaving. Nothing is too much trouble for her. 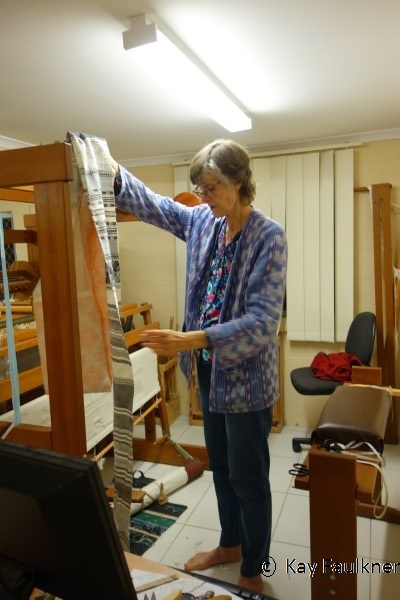 She is methodical, diligent, hard working and certainly a master weaver. 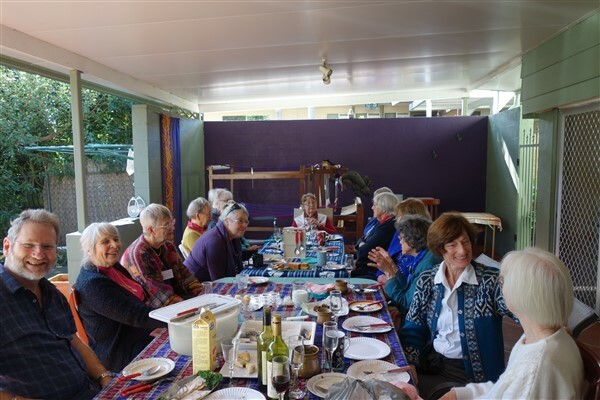 Met some great ladies from the Gold Coast Spinners & Weavers group. Also renewed acquaintance with Belinda from Bowral, New South Wales. And then I had to come down from the high of that week. Right in the middle of that week, the local paper came and photographed what was happening. The article appeared in the paper. And there was a flying trip to Emerald to take down my Pattern: A Universal Phenomenon exhibition. From this…. to this and in the car in 75 minutes. I think I broke all records. 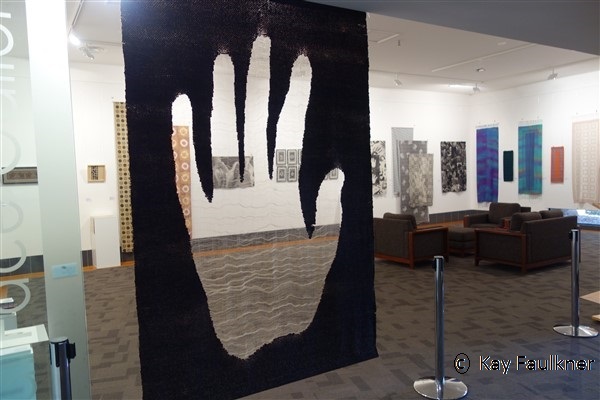 I would like to express my thanks to all who were involved in hosting this exhibition at the Emerald Regional Art Gallery. This is a beautiful space. 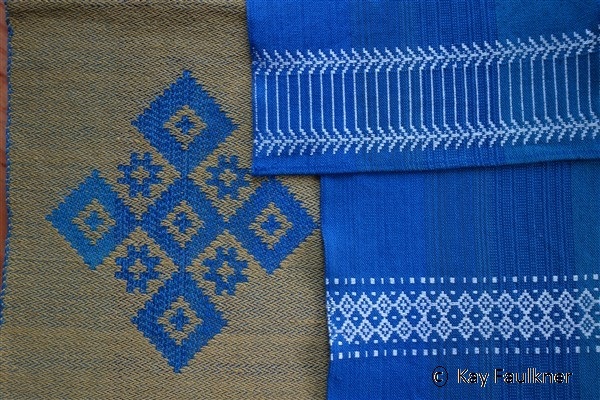 I have had some opportunity to continue exploring weaving on the Laos loom project. There is great enjoyment and in some ways it is a liberating experience to weave in the great outdoors. BUT it is winter and there were some days when it was just way too cold to play. And then it blew and no way was I going out in that. And then it rained. I did go and have a look but everything was damp. So I have also been discovering the down side of weaving on the patio. However, there were a couple of glorious days. So the story for this month…. Yes I have woven! 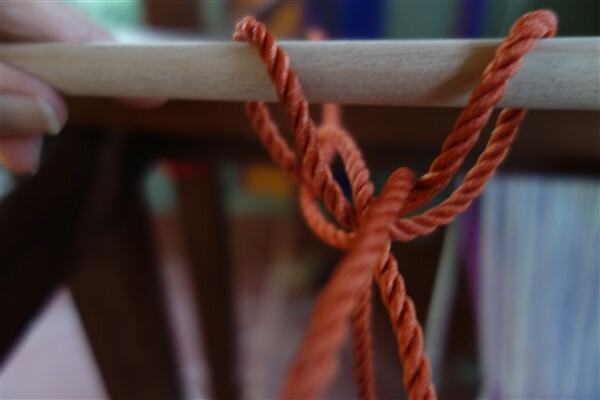 The tension knot (from last month’s blog) works fine. The improvised light treadles of a couple of lengths of pine function quite well though I discovered that they needed to be attached so that one was slightly off centre to the left and the other to the right so that they stayed separated. I was relieved to see that the shafts still stayed level and the swinging free beater works just fine. I can even weave parallel to the front beam! I was intrigued by the swinging beater and so had a go at setting one up on the countermarche loom. That’s easy as it has an overhead beater and I just removed the reed and strung it up with a couple of cords. Here it is just after I’d taken the reed out of the beater and before I removed the frame. I’m considering applications. It is remarkably light to weave with. There’s no way you could beat heavily with just this. It moves. I’ve found the one from the traditional Laos loom with it’s frame to be much heavier and easier to control. On a jack loom, I had to construct some sort of side support for an overhead rod. A trapeze that I use for warping, a couple of stockings to hold it tightly in position and a rod to suspend the reed from work just fine. Yes I’m playing , proving that it can be done and one never knows what comes out of a bit of play. A wider reed makes for easier parallel weaving. Back to the Laos loom and real weaving. I have discovered some facts. I have discovered that there is a lot of loom waste. The tension knot takes well over 50 cm of warp just to do the knot. 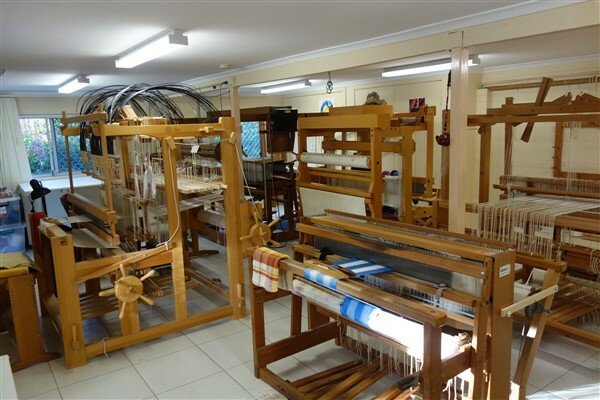 Unless there is some means of spreading a warp, there needs to be quite a length from the front of the loom to the back to enable this to occur. In Laos I only saw 2 instances of a weaver employing a ‘spacer’ at the top of the loom to do this. This explains why the looms are so long. 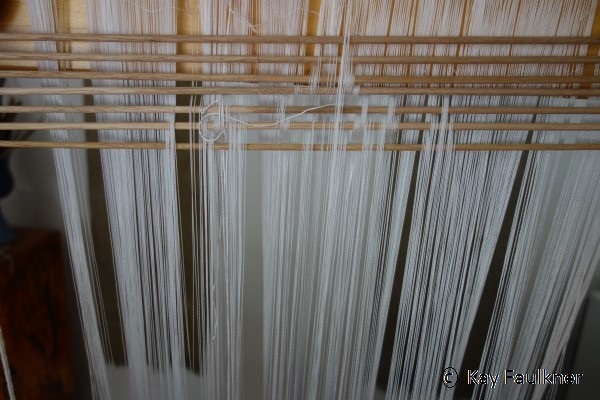 I have inserted two sticks behind the vertical storage to help spread the warp. 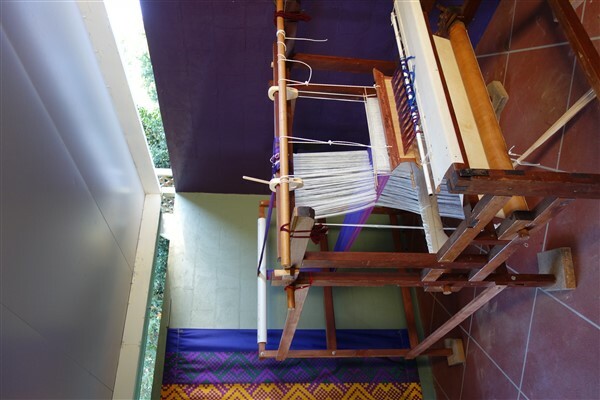 Because the loom is so long it has little effect on the height of the shed when weaving. I’m calculating that the amount of loom waste as it is now is probably at least 2 meters. So after weaving 5 cm or so, I considered my options. I would soon run out of warp if I continued. I do want to maximize the experience of using that vertical storage system. I had proved that I could weave on it as is. This amount of loom waste and the time it takes to set up the loom even without setting up any vertical storage, sure makes sense to wind very long warps. 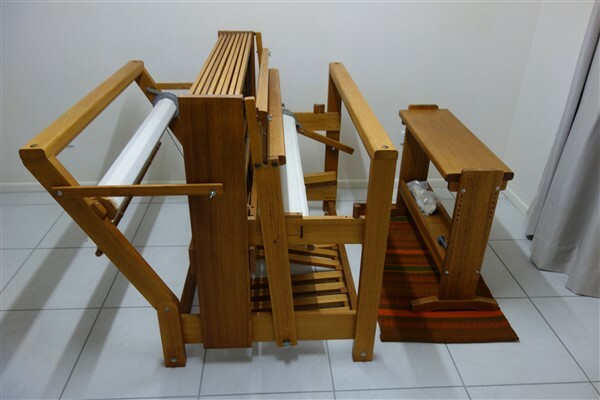 How to minimize loom waste? I got out the trusty drill and moved a few bars at the back and converted to using long ties and the warp beam that I’d left on the loom. Now I have a more conventional loom waste and can weave right up to behind the vertical storage. 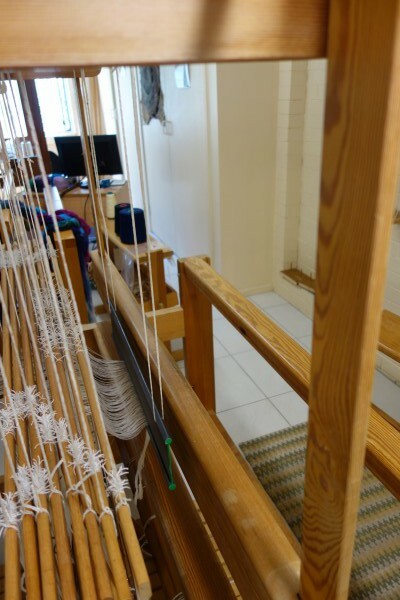 The loom now looks more like something Western weavers are used to seeing. At the same time I thought I’d reconstruct the beater and put the reed into it. Note the stockings securing it in place. I had to move the vertical storage forward to be able to use the warp beam where it was. The loom is now a mix of East and West. 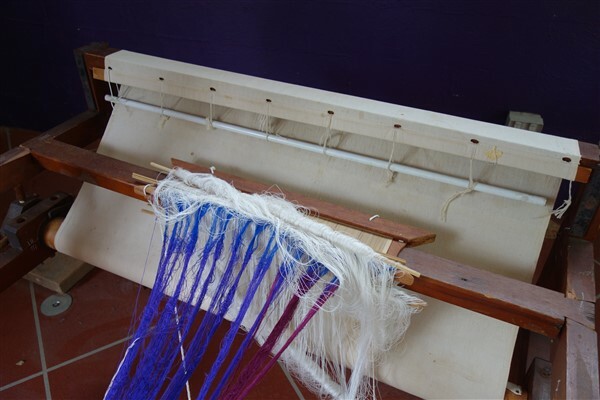 Of course in all the process of winding the warp onto the back beam without cutting off the original weaving, there was some difference in tension, though much less than one might expect. So after retying the knots the loom is again ready to weave. The original weaving is still there but of course now distorted. The second pink line will be the beginning of the next adventure. Next step will be leaning about vertical storage systems. Lastly: Joan’s pink warp needed to be woven off. I wanted to be able to show students (and I will be seeing Joan in a couple of weeks) that there is a wide range of diversity achievable from using a given set of parameters. 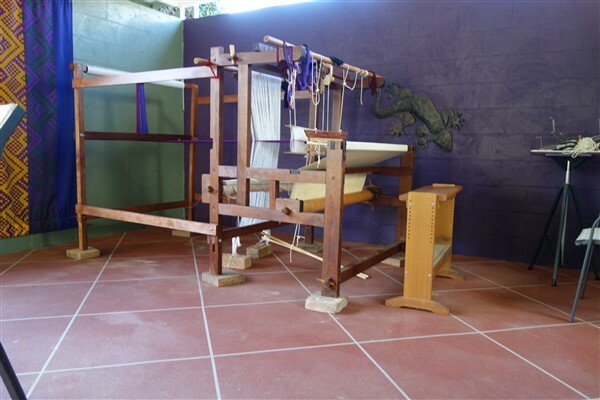 I have used the same treadle tie up (8 shaft twill sequence) as Joan had with the addition of plain weave to weave this collection of towels, placemats and serviettes. 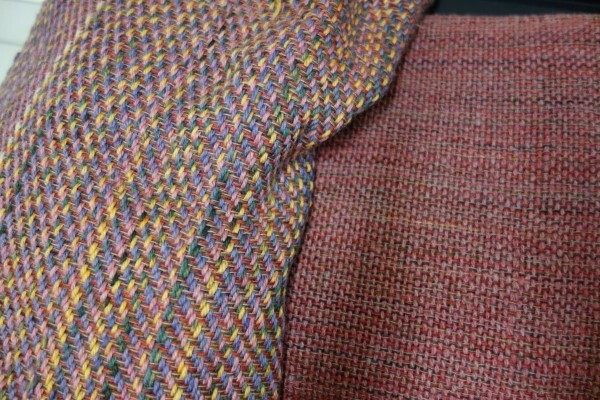 Apart from a huge diversity of twills achieved simply by using the treadles in different sequences, the twill sequence can be combined with plain weave as a supplementary weft in various styles. 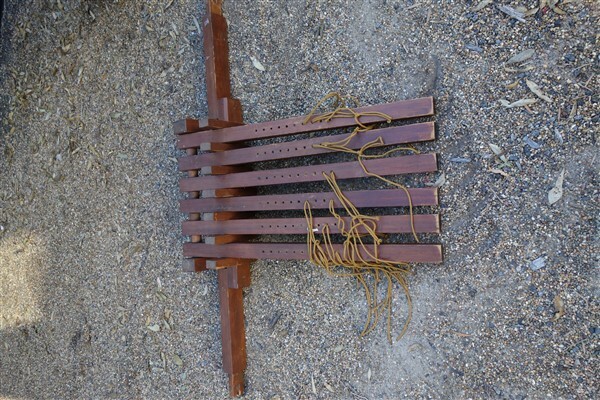 All have elements of Joan’s original treadle tie up. One day a week classes have started on Tuesdays. 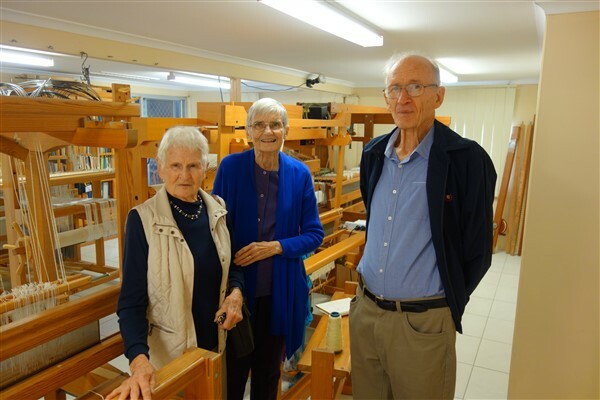 There are 3 students with one totally new weaver and two “beginners”. After 2 weeks the looms are threaded and in one case weaving is well underway. 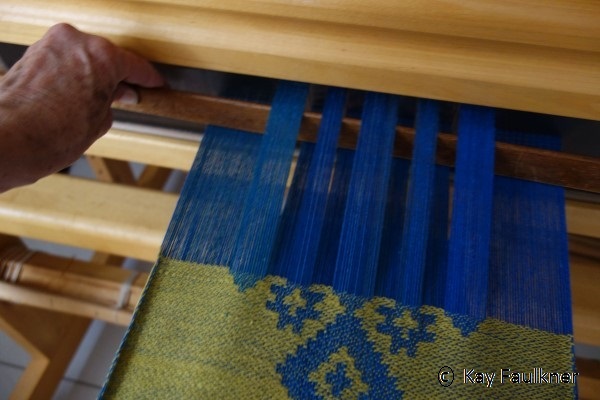 It is always exciting seeing weaving happening. You are currently browsing the archives for the Loom modifications category.